In Greek, stenosis means "a narrowing." Spinal stenosis, then, is a narrowing of your spinal canal—the area your spinal cord and nerves travels through. When this area becomes narrower, your spinal cord and nerves can get pinched and squeezed. Doctors often call this squeezing "compression." What's causing my spinal stenosis? Most often, spinal stenosis is the result of disease or injury to the spine. 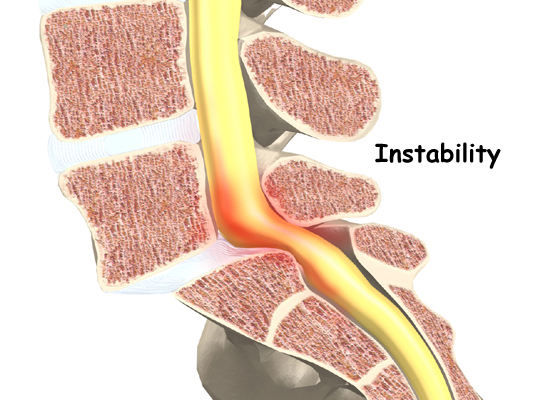 The leading cause of spinal stenosis is wear and tear on the spine due to aging. In fact, the most common direct cause of spinal stenosis is osteoarthritis, where the cartilage that cushions joints starts to degenerate due to age. Other causes of spinal stenosis are bulging discs, herniated discs, or injury to the spine. Some people are born with spinal stenosis, but that is very uncommon. What are some non-surgical ways to deal with my spinal stenosis? You can try acupuncture or massage, two alternative treatment options that some patients have found helpful. You can do some easy exercising to strengthen the muscles around your spine so that it's better supported—that could help reduce the pain. Swimming is a good form of exercise for people with spinal stenosis. You can use over-the-counter NSAIDs (non-steroidal anti-inflammatory drugs) that will help reduce the inflammation and pain. NSAIDs include aspirin, ibuprofen , indomethacin, and naproxen. Your doctor may send you to physical therapy. If you have a severe case of spinal stenosis, your doctor may use an epidural steroid injection into the spinal fluid around your spinal cord and nerve roots. An injection puts anti-inflammatory medicine into the epidural space to decrease the inflammation of the nerve roots. You've tried non-surgical treatments, and they haven't been successful. What kinds of surgery are used for spinal stenosis? Decompression, where they remove tissue pressing against a nerve structure by making more room in the spinal canal (for the spinal cord) or in the foramen (for the nerve roots). Some common decompression surgeries are: , laminotomy, and foraminotomy. Stabilization, where they work to limit motion between vertebrae. Not everyone who has surgery for spinal stenosis will need stabilization, which is also known as spinal fusion. The need for stabilization depends mainly on how many vertebrae your surgeon needs to work on.